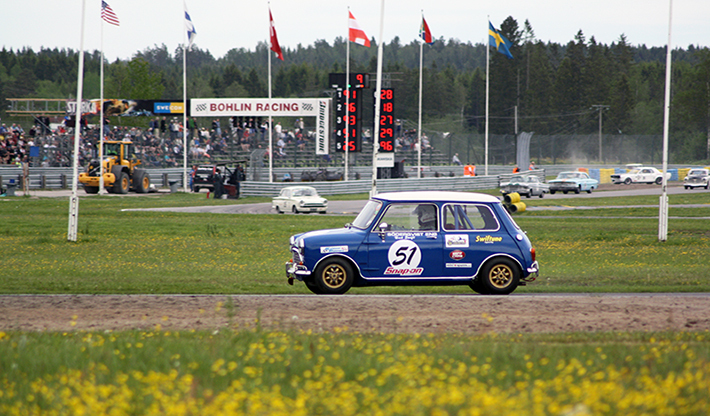 At the beginning of June, Swiftune headed to the Karlskoga circuit in Sweden for the first time to take part in Oldtimer Grand Prix, which is known as the Swedish version of the Goodwood Revival. Spread over the weekend of the 13th/14th June, the event featured a wide variety of grids including Formula Junior, 70’s Saloons and Pre-66 Touring Cars which featured Nick Swift in the Soderqvist Mini which was the Sanwa Trophy Endurance winner at last years Mini Festival driven by Swedish rally legend Stig Blomqvist. The race featured Mustangs, Galaxies, Cortinas and over 15 mini’s with altogether over 30 cars competing. There was a great fight ahead for Nick to claim a podium finish, however thanks to a Cortina and Galaxy colliding while battling for top spot Nick was able to push his way to Second place just behind the Mustang of Victor Israelsson. The Swiftune powered Mini of Daniel Frodin finished second in class and a fantastic 5th overall, while Edwin Solheim battled his way through the grid in his Swiftune powered Mini to finish 10th after qualifying at the back. Race 2 wasn’t as lucky, as nick was handed a 30 second penalty for overtaking under yellow flag and pushed back to 6th place and missing out on a podium finish. Thanks to the Soderqvist team for prepping a fantastic car!